I saw that I saw the world as a mosaic. I see I see a crane fishing in shallow water. the straightened neck one square wide. more than I can see. Karina Lutz is a writer, editor, teacher, and lifelong activist. She helped secure passage of sustainable energy legislation, thwart a proposed megaport, and restore wetlands in her home watershed of Narragansett Bay, RI. In 2013, she received honorable mention from Homebound Publications Poetry Prize for her manuscript, Preliminary Visions. Her poems have been published by Tulane Review, Blueline, Written River, The Wayfarer, Poecology, Twisted Vine, Bleeding Lion, Buddhist Poetry Review, Green Living Journal, PDXX Collective, S/tick, Narrative Northeast, and The Transnational. 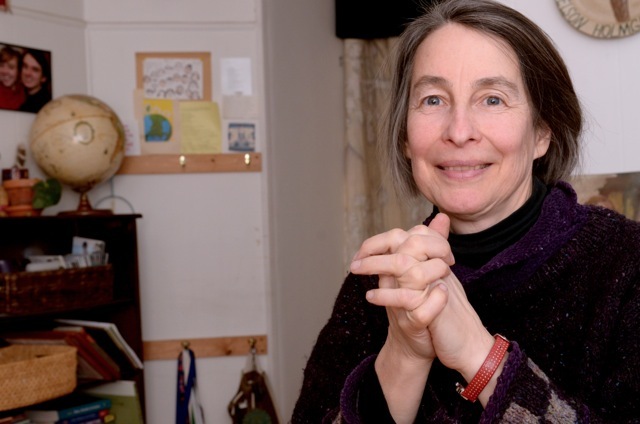 She has performed her epic peace poem, "Encircling Earth" at dozens of venues in New England.